MOSCOW -- In recent years, state-owned natural gas pipelines in Ukraine have been the source of such tension that a midwinter fight between Russia and Ukraine over pricing — often leading to Russia’s shutting the valves and leaving people in Europe freezing — has become an annual ritual. 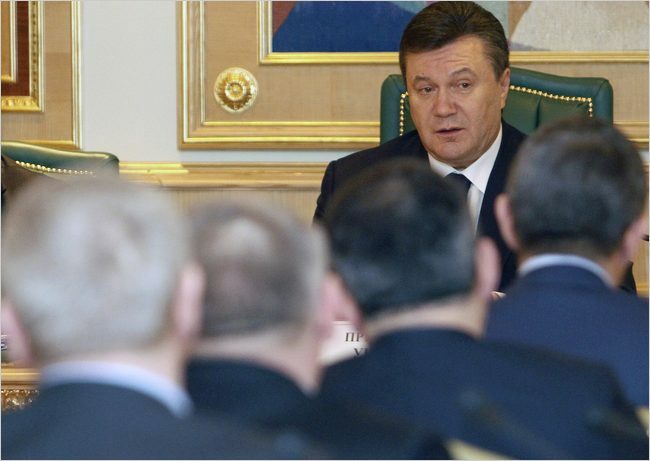 President Viktor F. Yanukovich has made the Russians an offer on gas pricing. To prevent such blowups in the future, Ukraine’s new Moscow-friendly president, Viktor F. Yanukovich, has proposed an improbable solution. This week he opened negotiations with the Kremlin to sell control over the pipelines’ operations to a consortium including Ukraine’s usual antagonist in these disputes, Russia’s natural gas giant Gazprom, and an unspecified European company. Russia has already negotiated similar agreements with Belarus and Armenia, where Gazprom owns stakes in the pipeline systems with implied vetoes over strategic energy decisions and in exchange sells gas at steep discounts. Belarus, for example, now pays $168 for 1,000 cubic meters of gas compared with $305 in Ukraine. If Ukraine had the lower price, it would save about $3.7 billion a year, supporters of Mr. Yanukovich’s proposal say. From Russia’s perspective, the deal would be a coup in the long-running quest for supremacy of the Eurasian pipeline network, sometimes called a modern version of the Great Game, after the 19th century struggle between Russia and Britain for colonial possession in Central Asia. Even partial control of the Ukrainian pipelines, which carry about 80 percent of Gazprom’s exports to Europe, could eliminate the need for Russia to build a costly new pipeline under the Black Sea from Russia to Bulgaria around Ukraine, called South Stream. But the idea — illegal under existing Ukrainian law — is controversial even though it would help put debt-strapped Ukraine back on its feet. Kiev spends billions every year subsidizing gas prices for consumers, and the International Monetary Fund has made reducing such outlays a condition for resuming lending halted last fall. Ukrainians now pay about 30 percent of the true cost of heat and electricity, according to Olena Bilan, chief economist for Dragon Capital, a Kiev investment bank. The I.M.F. has suggested a variety of austerity measures, including politically unpopular steps like raising fees for residential heating. That would not be necessary, however, if Mr. Yanukovich could swiftly close a deal with Moscow to lower the gas price. The idea of transferring pipeline control to a Russian-European consortium may comfort some European consumers, but it sends chills through many Ukrainians, who remain fearful of creeping Russian influence after spending centuries as part of Moscow’s empire. “When the Kremlin loans money, it doesn’t want interest, it wants political concessions,” Sergiy Terokhin, a former minister of the economy, said in a telephone interview from Kiev. Iryna M. Akimova, Mr. Yanukovich’s chief economic adviser, said Mr. Yanukovich was merely fulfilling a campaign promise by negotiating with the Russians on gas, and if it helped meet international lending requirements, all the better. “The new president considers it very important to build good economic relations with partners in the West and the East,” Ms. Akimova said.